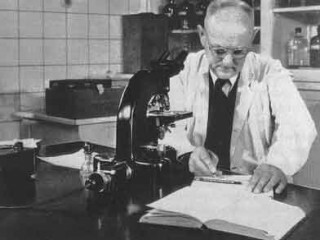 Gerhard Johannes Paul Domagk (30 October 1895 – 24 April 1964) was a German pathologist and bacteriologist credited with the discovery of Sulfonamidochrysoidine (KI-730) – the first commercially available antibiotic (marketed under the brand name Prontosil) – for which he received the 1939 Nobel Prize in Physiology or Medicine. Gerhard Domagk researched infections caused by bacteria, and found that an industrial dye, prontosil rubrum, had antibacterial action that proved an effective treatment for staphylococci and haemolytic streptococci. While staph infections are generally minor maladies today, in Domagk 's time the only effective treatment usually involved amputation of limbs. It was also the first sulfa drug, the group of sulfur-based antibiotics that interfere with bacterial metabolism. Sulfa drugs are still used today. For his discovery of prontosil's therapeutic effect, Dr Domagk was named a Nobel Prize winner in 1939, but he was ordered by Nazi authorities to decline the honor. His mother was driven from their family home, and starved to death in a refugee camp. He became FRS in 1959, his short biography was published by the Royal Society in 1964.He changed his focus to tuberculosis and chemotherapy against cancer. He continued to live and work in Wuppertal. Domagk died in Burgberg near Königsfeld, Schwarzwald. View the full website biography of Gerhard Domagk.